By 1935, the Depression got worse. Gas got harder to find, and I was forced out of business. 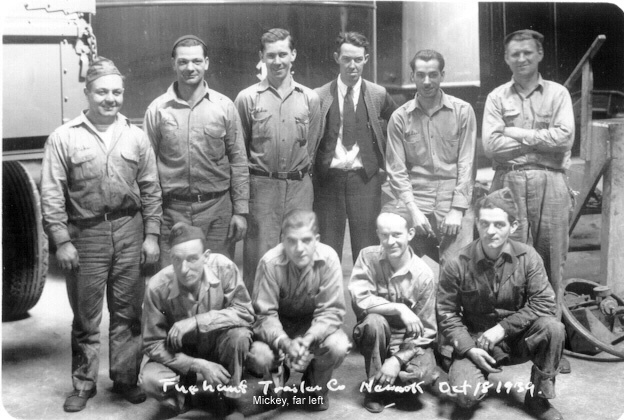 Fortunately, I was lucky to get a mechanic's job at the Fruehauf Trailer Company on Beacon Street in Newark (insert- back row, left). My father-in-law, Louis Mango, had a barbershop just around the corner from Fruehauf. He would often cut and trim the hair of some of Fruehauf's personnel, and quiz them about job openings. He told me they were looking for a mechanic with a background in truck work, so I interviewed for the job and was hired. The Fruehauf facility was a small branch location. There were only about nine or 10 mechanics, plus an office manager, a service manager and three salesmen. I stayed there for four years and built a reputation for myself as a good and dependable mechanic. The service manager and I got along very well and became quite comfortable working together. Because of my adaptable workmanship and his knowledge of truck repair, we soon became the team that would handle most of the service calls to special customers. He would assign me to the major road jobs requiring eight or more hours of labor. In late 1937, the world was preparing for a war in Europe. Our Fruehauf branch received an order for 1,500 trailers from The Army Signal Corps. These trailers arrived on flat railroad cars--five or six trailers piggyback on one car. Another man and I were assigned to go to the railroad depot, unload and inspect the trailers, then deliver them to their proper location at Breeze Corporation on Freylinghysen Avenue. The trailers had special radar equipment installed by the Breeze Corporation and then the Signal Corps would transfer them to Western Electric Corporation, which would complete the work. The trailers were then covered with a tarpaulin and moved by The Signal Corps to be installed at Fort Hancock, New Jersey, which is located at Sandy Hook, just off the Atlantic Highlands. Sandy Hook is a beautiful peninsula extending several miles out into the Atlantic Ocean. 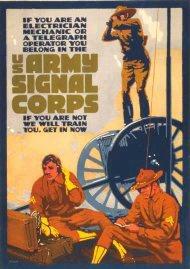 It consisted of long sandy beaches and was solely occupied by The Signal Corps. No one was admitted except by special pass. A government inspector was with us from the time the trailers left the railroad car to the time they arrived at Fort Hancock. These inspectors were politically appointed and made their job out to be very important in order to build up job security. If an inspector detected any fault with the trailer or the radar equipment, regardless of how insignificant, he would write up a report and it would have to be corrected by whoever was responsible--Fruehauf, Breeze Corporation, or Western Electric. It was my job to correct any defects found with the trailers. Most of the defects the inspectors found were not worth the paper the reports were written on, but it counted as a plus in their record as job inspector. One day an inspector found a 1/4" steel sliver in a wheel hubcap. A complaint was made and we had to remove all the hubcaps on 1,500 wheels. It wasn't much, just a matter of taking off four bolts and inspecting the grease inside. If there were no slivers, we would re-install the cap and make note of the trailer serial number. Out of the 1,500 hubs, we didn't find more than five caps with slivers in them. The small slivers would have made no difference to the operation of the wheel. But that's government for you! All this repair work on the trailers was done at Fort Hancock, which meant that I had to drive from Newark to Fort Hancock every day for one year in order to correct any complaints. I would drive down in my car with a helper at 8:00 a.m. and return at 4:30 p.m. Fruehauf compensated me for the mileage and wear and tear on my car.